Nate Cotanch, a lifelong Hatch Chile eater whose roots stem from a family of 17 children from north of Santa Fe, New Mexico, is the founder of Zia Green Chile Company. 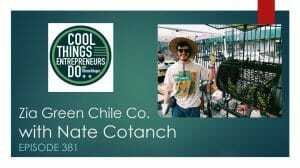 Cotanch was featured in Brooklyn Magazine’s “30 Under 30” Class of 2018 and in Forbes as “One of 10 Innovators Under 30 Shaking Up The New York Food Scene.” Prior to founding Zia, Nate Cotanch worked in the NYC venture capital scene analyzing early to growth stage ventures across multiple industries. Georgia has its peaches, Idaho has its potatoes, and New Mexico has Zia Hatch Chile — exclusively grown in the Hatch Valley of New Mexico from family owned farms and harvested only once in the fall each year from around August until Mid-October. Like products of the Champagne region of France, a true Hatch Chile comes from nowhere other than the Hatch Valley of New Mexico. It’s about terroir. Great show and I learned about Hatch Chili’s. Thanks for sharing the info. I use to live in Austin and don’t remember the cook offs!